Curiosity about the inaugural Stanley Film Festival led us to our next hike in Estes Park a little bit earlier than anticipated. We embarked on our journey around 11:00 am, this time with siblings and friends in tow and first made our way to the famous hotel (the location where the The Shining was set written by Stephen King and later adapted for film by Stanley Kubrick) to get our tickets for our evening haunted movies and activities. The hotel is quite exquisite, with its bright white paint and red roof standing out brightly against the backdrop of Rocky Mountain National Forest at an elevation of 7,800 feet. 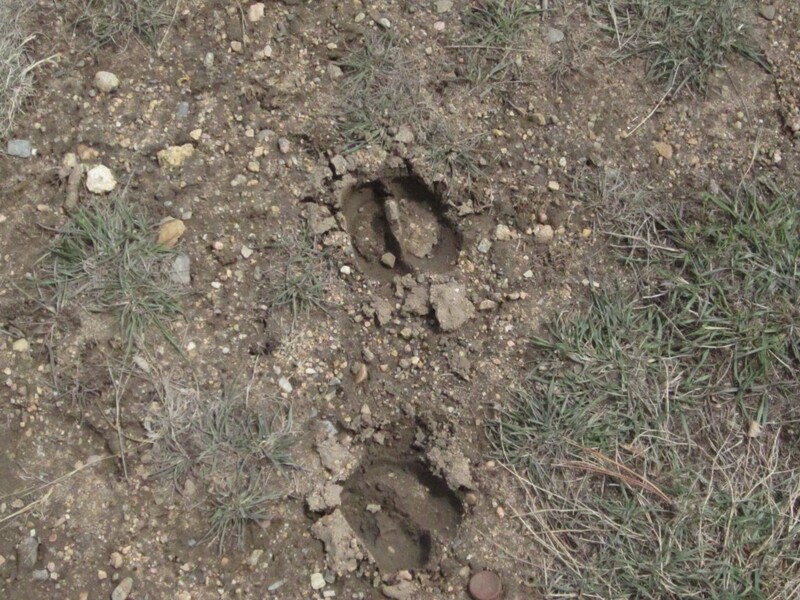 On our way into the National Park to find the trailhead we also stopped at Estes Lake and found Elk tracks and then a large heard of elk. 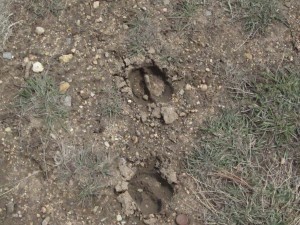 You can see the tracks in the bottom right and the herd with Will in the bottom left. 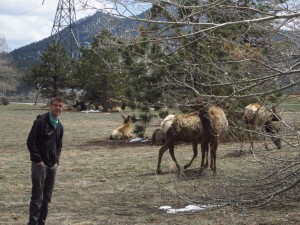 The elk were very docile and right next to a hike and bike path around the lake. We also saw some prairie dogs around the lake as well. The lake also has a nice view of the Stanley Hotel. 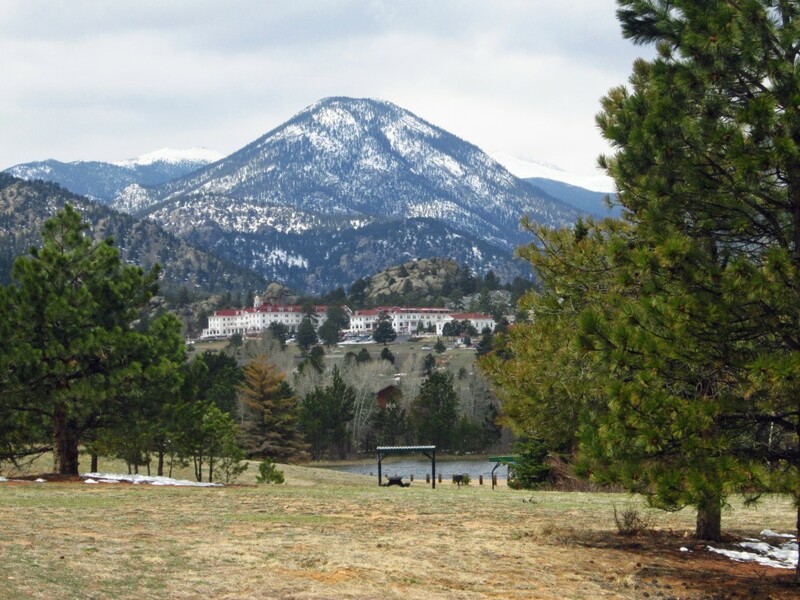 You can see the Stanley hotel in the background of the top right picture and a view of Estes Lake in the top left. 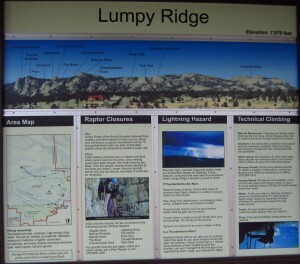 We then headed to the Lumpy Ridge trailhead, which is just off the Devil’s Gulch Road. 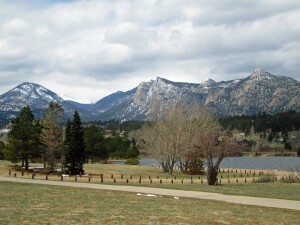 Although Rocky Mountain National Forest offers numerous hikes, access to these particular trailheads and parking are free. 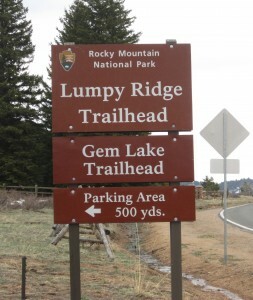 Below are the signs for the trailheads, and the park showing that the Gem Lake hike is an offshoot of the larger Lumpy Ridge trail. The Gem Lake Trail is an out and back hike approximately 3.6 miles in distance with a gain in elevation of about 1080 feet. The first mile or so of the hike took us up a steady incline through ponderosa pines, spruces and firs. 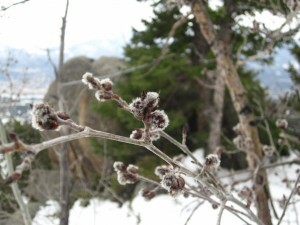 Though the trees were green and most of the snow gone on this part of the hike, it was still a bit early in the season for wild flowers. 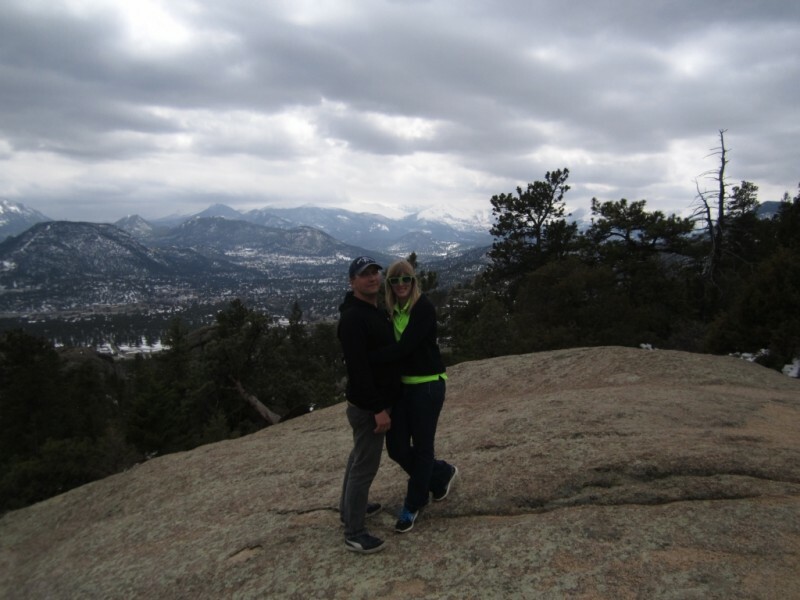 This part of the hike had a constant steady incline, but the magnificent views of Estes Park after the first mile where well worth it. The landscape was very unique in this area as well. 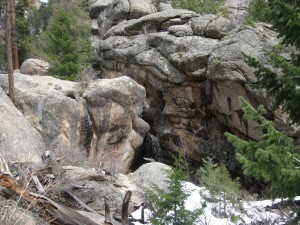 There were numerous boulders surrounding the trail, some of which, if you look closely enough resemble faces. 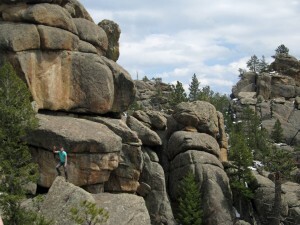 We both thought that the rocks in the photo below on the left resemble faces with long noses. I’m sure if you go there and look closely, you too will be able to find pictures and stories in the rocks as well. Adventurous Will, felt it necessary to take a closer look at this cluster of boulders as you can see in the bottom right photo. As we ascended higher and got closer to Gem Lake, we reached areas in which the snow had not yet melted. Temperatures dropped at this area, and to be honest, it was a little tough going at this point. 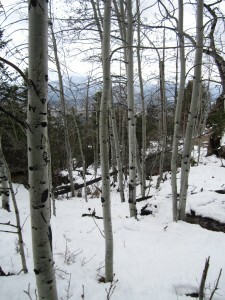 The trail was very steep and covered in ice and snow. 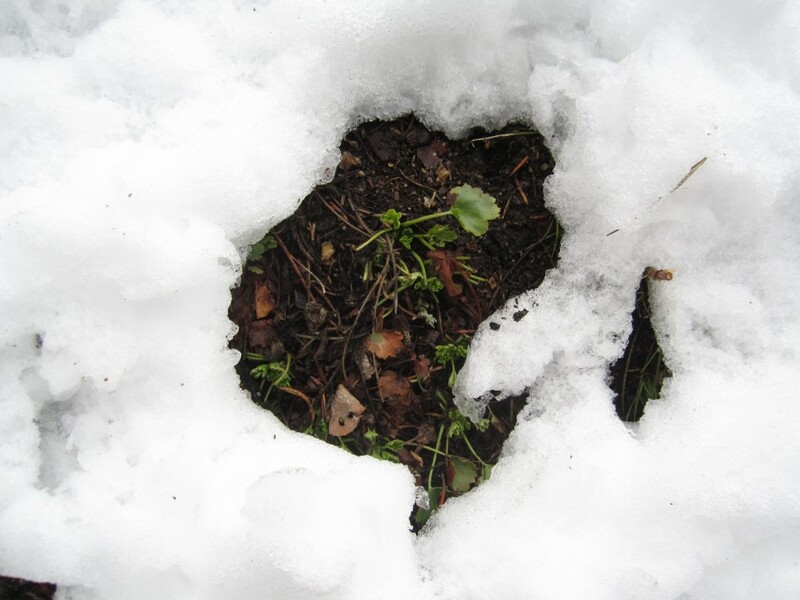 Despite the cold temperatures, Spring was still trying to give rise to life as you can see in the bottom left picture green shoots sprouting up, surrounded by snow. The last quarter mile to Gem Lake was the slowest portion of the hike, and it was a very exciting site to crest the final set of steps and see the glistening ice/water mix. Since it was early May, the lake was still partially frozen, but very beautiful. The lake is unique because it has no true inlet or outlets for incoming water. 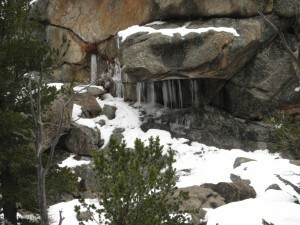 The surrounding boulders and sheer rocks, channel and collect rain water into the shallow basin. The lake can be seen below. The wildlife on the trail was less exciting than at Estes Lake, but there were some neat sights. 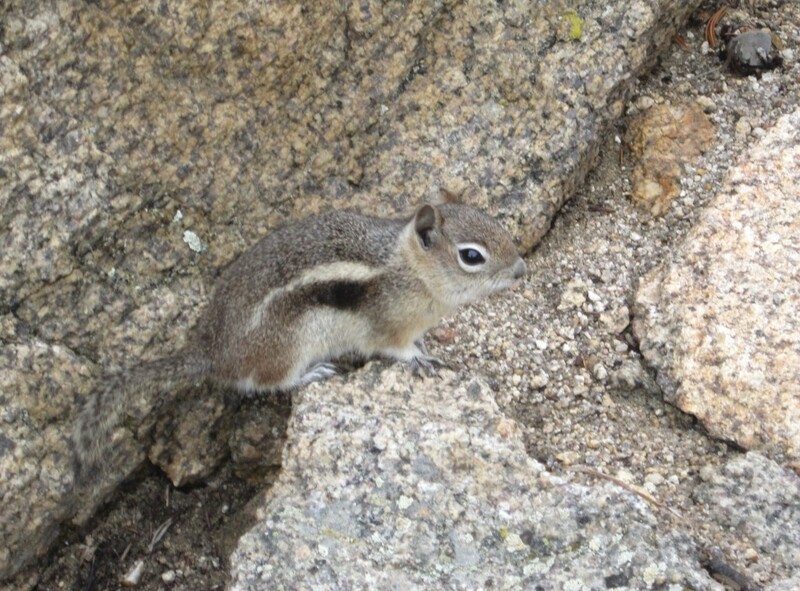 Once we had hiked for about 75 minutes and had begun the final ascent to the lake, we started to see numerous chipmunks, one of which I captured in the below left picture. They were very skittish but highly inquisitive and very cute. On our way off the trail towards the end of our hike, we spotted a Steller’s Jay, also known as a Crested Jay or Mountain Jay. They are related to Blue Jays but are black from the mantle up to the head and also have a large black crest atop their head. They are very pretty birds, but stick to high up in the trees and can be tough to get a good picture of. This Steller’s Jay was high up in a pine and very intent to wait us out. 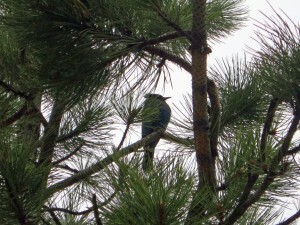 He or she had a partner and a nest in the pine just across from where I took this picture. We could see raptors flying high above ,and the area is protected for these birds of prey, including Bald Eagles and many other falcons, eagles, and hawks. Overall, this was a spectacular hike, and we highly recommend it. At times it is a bit strenuous, with high elevation gains, but the views are spectacular and well worth it. While most of the hike was still very nice in early season, it might be an easier ascent as you get closer to the lake once all of the snow has melted. Though we saw some wildlife, the trail does get heavy traffic, so it might not be your best bet for bird watching or seeking out other wildlife. 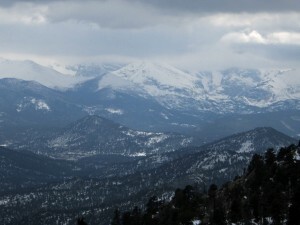 View from Gem Lake Hike, Panorama. Will bouldering in Panoramic shot of Gem Lake Hike. Mountains hidden in the clouds, viewed from Gem Lake Hike. Icicles on cliff at Gem Lake. 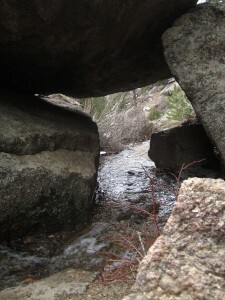 View of the stream through rock formation, Gem Lake hike. Rock formation looks like man with waterfall coming out nose. Will waving back at us, gives a sense of perspective of the size of rock formations. Most likely a quaking aspen tree budding. is very low. You are loosing a lot of traffic. You need high PageRank backlinks to rank in top10.